IBM® Rational® Application Developer for WebSphere® Software V7.0 (for short, Rational Application Developer) is the full function Eclipse 3.2 based development platform for developing Java™ 2 Platform Standard Edition (J2SE™ ) and Java 2 Platform Enterprise Edition (J2EE™ ) applications with a focus on applications to be deployed to IBM WebSphere Application Server and IBM WebSphere Portal. Rational Application Developer provides integrated development tools for all development roles, including Web developers, Java developers, business analysts, architects, and enterprise programmers. 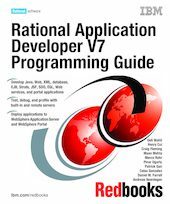 This IBM Redbooks® publication is a programming guide that highlights the features and tooling included with Rational Application Developer V7.0. Many of the chapters provide working examples that demonstrate how to use the tooling to develop applications, as well as achieve the benefits of visual and rapid application development. This publication is an update of Rational Application Developer V6 Programming Guide, SG24-6449.